Benjamin Netanyahu’s planned speech to the United States Congress next week has led to much talk of a rift between the Israeli prime minister and the US president, and even between their two countries. Citing protocol of not meeting foreign leaders too close to an election, President Barack Obama will shun his Israeli counterpart in Washington, and Vice President Joe Biden will stay away from the joint session of Congress when Netanyahu appears. The dispute has taken on rancorous partisan tones with more than two dozen Democratic lawmakers vowing to boycott the speech. They charge that Netanyahu’s goal is to undermine the president’s diplomacy with Iran, and that Republican House Speaker John Boehner invited the Israeli leader to defy and humiliate the White House. Yet all those objecting to the speech, whether in the United States, or Netanyahu’s rivals at home, where he faces an election next month, protest that their concern is to guarantee US-Israeli relations on whose strength the very future of Israel is said to hang. But what all this sound and fury misses is that for the Palestinians, there is no meaningful Obama-Netanyahu rift. Indeed US-Israeli relations have never been stronger, nor more damaging to the prospects for peace and justice and for the very survival of the Palestinian people. Just look at the recent record. Last December, the Palestinian Authority put forward a tepid resolution in the UN Security Council that did little more than repeat long-standing US policy on the outlines of a two-state solution. Obama’s UN ambassador Samantha Power marshaled all her resources to defeat it. These words are perverse. Israel’s 51-day long attack on Gaza that left more than 2,200 people dead didn’t “damage the atmosphere” as far as the Obama administration was concerned, but any Palestinian effort to use international bodies in pursuit of justice and accountability is tantamount to an act of war. I challenge Power to go and repeat her words to any of the 100,000 Palestinians in Gaza still living in the damp and freezing rubble of their homes, to the surviving parents of more than 500 children killed in the Israeli attack, or to the thousands who will live with lifelong injuries. Few Palestinians will forget that when Israeli fire was raining down on them, the Obama administration authorized the transfer of grenades and mortar rounds to resupply the Israeli army. Last summer’s war was something even Hamas leaders tried to avoid. After it began, armed Palestinian groups declared that their goal was a ceasefire accompanied by a lifting of the eight-year siege that has devastated Gaza’s economy and isolated its 1.8 million people from the rest of humanity. Since the war, promises that the siege would be lifted have been broken. Billions pledged in reconstruction aid have failed to materialize. As a result, cash-strapped UNRWA, the UN agency for Palestine refugees, has suspended repairs on Gaza homes. Israel’s view tends to be unquestioningly echoed by US officials and media: that Palestinians are at fault for the repeated surges of violence. Yet even senior Israeli leaders and officers have often acknowledged that Palestinian armed groups, especially Hamas, have meticulously stuck to ceasefire agreements, as they are doing currently. Despite this, the US put no pressure on Israel to end the years-long blockade. As a result, the lesson Palestinians have repeatedly learned is that whether they fight or stay quiet, Israel will be allowed to do as it pleases. It can besiege and slaughter them in Gaza, seize and colonize their land in the West Bank, deprive them of their most fundamental rights, and Obama will have Israel’s back. Just because Obama, Netanyahu and their partisan followers may be peeved at each other does not change the basic dynamic of full US support for Israel’s occupation of millions of Palestinians, the continuation of which guarantees ongoing suffering with regional repercussions. Sure enough, despite the supposed rift, the US is proceeding with the sale of more of the most advanced F-35 fighter jets to Israel. That’s why Palestinians do not see any substantive Obama-Netanyahu rift on life and death matters for them. But there urgently needs to be one. It is long past time for the American people and their representatives to challenge Israel on its seemingly permanent subjugation of the Palestinians. This post was first published by The Huffington Post. [In July, 2014, the Israeli military attack on the Palestinian people in Gaza was shown to be a terrorist, genocidal move, by forcing families to be confined, and then killing those who could not escape. This continued a practice repeated many times. Notably, in the previous Israeli assault on Gaza, in January 2009, the attack on the Al Zaytoun neighborhood began with soldiers, then two days of bombing, which struck the Al Samouni home, followed by soldiers shooting to kill. 26 members of the Al Samouni family were killed, including 10 children and 7 women. The Red Cross was only allowed entry three days later to evacuate the dead and injured, the majority of whom were so critical that they were taken to Belgium, Egypt, and Saudi Arabia for treatment. The names of children killed: Azza Salah Al Samouni, 3 years of age; Waleed Rashad Al Samouni, 17 years of age; Ishaq Ibrahim Al Samouni, 14 years of age; Ismail Ibrahim Al Samouni, 16 years of age; Rifka Wael Al Samouni, 8 years of age; Fares Wael Al Samouni, 12 years of age; Huda Nael Al Samouni, 17 years of age; Ahmad Atieh Al Samouni, 14 years of age; Mu’tassim Mohammed Al Samouni, 6 years of age; Mohammed Hilmi Al Samouni, 5 years of age. Names of Women Killed: Rahma Mohammed Al Samouni, 50 years of age; Safa’ Hilmi Al Samouni, 25 years of age; Maha Mohammed Al Samouni, 22 years of age; Rabbab Azzat Al Samouni, 32 years of age; Laila Nabih Al Samouni, 40 years of age; Rifqa Mohammed Al Samouni, 50 years of age; Hannan Khamis Al Samouni, 36 years of age. Names of Men Killed: Tallal Hilmi Al Samouni, 55 years of age; Attieh Hilmi Al Samouni, 25 years of age; Rashad Hilmi Al Samouni, 42 years of age; Tawfiq Rashad Al Samouni, 23 years of age; Mohammed Ibrahim, 26 years of age; Ziyad Izzat Al Samouni, 28 years of age; Nidal Ahmad Al Samouni, 30 years of age; Hamdi Maher Al Samouni, 23 years of age; Hamdi Mahmoud Al Samouni, 70 years of age. 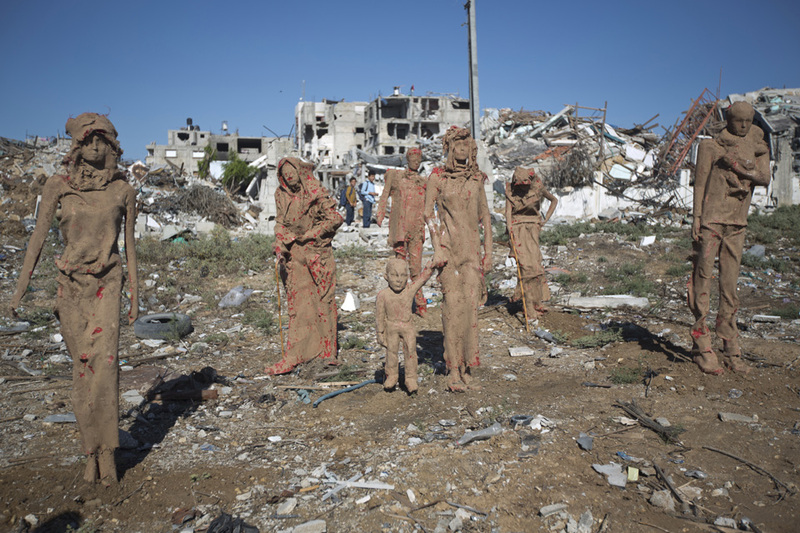 GAZA CITY – Among the mountains of rubble littering Gaza after a deadly summer war, clay outlines emerge of men, women, and children with a story to tell about fear, flight and destruction. Though his sculptures, which are made of fibreglass and covered with clay, Iyyad Sabbah relates the pain of those who lived through this latest conflict with Israel during which nearly 2,200 Palestinians were killed, mostly civilians. Some are splashed with blood-red paint, those closest to the ruins of homes flattened by bombs in Gaza City’s eastern Shejaiya district. The neighborhood, on the border with Israel, lay on the frontline when ground troops went in and was largely reduced to a wasteland in the war launched to halt cross-border militant rocket fire. It is in Shejaiya that Sabbah, a professor of art at Gaza’s Al-Aqsa University, has chosen to locate his installation, attracting many passers-by. “These statues recall the war, when we fled – men, women and children – some in just their underwear,” reflected Mohammed al-Latif, 20, who escaped his home shortly before it was flattened in an Israeli drone strike. “These statues are a new form of art by giving form to the suffering of Gazans,” said the artist, who was delighted at the warm reception local people have given to his figures of clay. It is astonishing that the reconstruction of Gaza, bombed into the Stone Age according to the explicit goals of an Israeli military doctrine known as “Dahiya”, has tentatively only just begun two months after the end of the fighting. 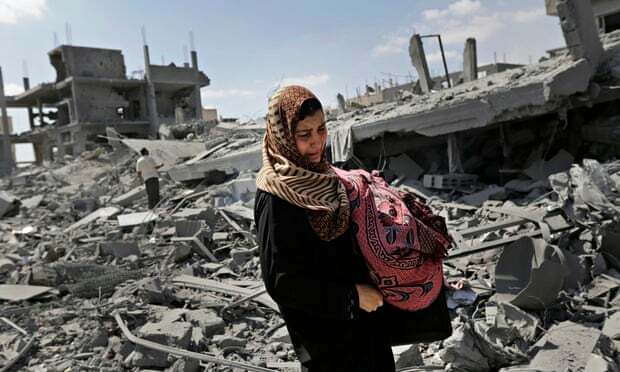 According to the United Nations, 100,000 homes have been destroyed or damaged, leaving 600,000 Palestinians – nearly one in three of Gaza’s population – homeless or in urgent need of humanitarian help. Roads, schools and the electricity plant to power water and sewerage systems are in ruins. The cold and wet of winter are approaching. Aid agency Oxfam warns that at the current rate of progress it may take 50 years to rebuild Gaza. Where else in the world apart from the Palestinian territories would the international community stand by idly as so many people suffer – and not from a random act of God but willed by fellow humans? Details given in a confidential briefing this week confirm that the UN has agreed to become the chief enforcer of Israel’s ongoing siege of Gaza. Under the guise of reconstruction, the UN will be monitoring and gathering private information about Palestinian households to be passed onto Israel, which will have a veto over which families get aid to rebuild their homes. This was presented as part of an effort to try to entrench and legitimize the Israeli-backed Ramallah-based Palestinian Authority of Mahmoud Abbas in Gaza. Under the arrangements, Israel will be given even more intrusive control over the lives of Palestinians in Gaza, who will be subjected to onerous ongoing monitoring as they try to rebuild their houses, communities and lives following Israel’s summer massacre. UN agencies estimate that almost 90,000 homes must be rebuilt, in addition to hundreds of schools and other major infrastructure systematically destroyed in Israel’s attack, or degraded by years of blockade. Protesters angered by Israel’s military actions in Gaza gathered at the Port of Oakland on Saturday morning in an effort to prevent a cargo ship managed by an Israeli company from unloading. Longshore workers did not unload the ship, the Zim Shanghai, because of safety concerns posed by the presence of several hundred protesters and about 50 police officers, said Craig Merrilees, spokesman for the International Longshore and Warehouse Union. The ship is docked at the port’s Berth 59, he said.